Important Disclaimer: This floor plan is not to scale. Square footage is approximate. This image represents an approximation of the layout of this model, it is not exact. 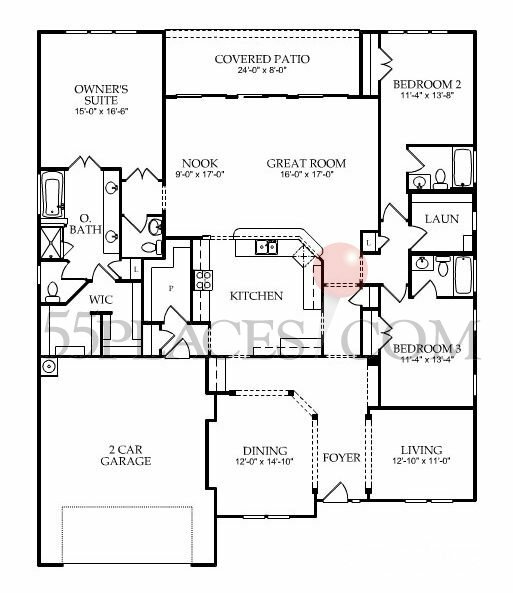 Variations of this floor plan exist that may not be represented in this image. Room sizes are approximate and may vary per home. Floor plans are subject to change without notice. Locations of windows, walls, doors, appliances and fixtures vary per home and may change based on optional features and exterior elevation choice. Optional features may be depicted that are not included in the base price. Due to after construction additions and changes, resale home floor plans may vary considerably from what is shown. Due to market conditions, availability and pricing of this model changes frequently. 55places.com is not affiliated with the builder of this home. 55places.com and its affiliated agents and the builder of this community take no responsibility for inaccuracies displayed on this floor plan or on 55Places.com. Please verify all information prior to purchasing. Charleston - 1039 Sq. Ft.
Whitman - 1236 Sq. Ft.
Summerton - 1236 Sq. Ft.
Clayton - 1498 Sq. Ft.
Dickinson - 1498 Sq. Ft.
Cardinal - 1055 Sq. Ft.
Robin - 1252 Sq. Ft.
Wren - 1452 Sq. Ft.
Lark - 1675 Sq. Ft.
Starling - 1936 Sq. Ft.
Acadia - 1085 Sq. Ft.
Chesapeake - 1306 Sq. Ft.
Adirondack - 1524 Sq. Ft.
Currier - 1097 Sq. Ft.
Rockwell - 1306 Sq. Ft.
Hemingway - 1524 Sq. Ft.
Jamestown - 1151 Sq. Ft.
Saratoga - 1290 Sq. Ft.
Shenandoah - 1360 Sq. Ft.
Potomac - 1480 Sq. Ft.
Washington - 1631 Sq. Ft.
Hillcrest - 1152 Sq. Ft. Noir Crest - 1234 Sq. Ft.
Steel Creek - 1355 Sq. Ft.
Taft Street - 1424 Sq. Ft.
Clear Creek - 1243 Sq. Ft.
Cape Cod - 1420 Sq. Ft.
Hancock - 1542 Sq. Ft.
Nantucket - 1566 Sq. Ft.
Whitney - 1598 Sq. Ft.
Fox Run - 1244 Sq. Ft.
Gray Myst - 1392 Sq. Ft.
Pine Spring - 1414 Sq. Ft.
Hamilton - 1634 Sq. Ft.
Eastman - 1721 Sq. Ft.
Revere - 1856 Sq. Ft.
Remington - 2068 Sq. Ft.
Madison - 2085 Sq. Ft.
Teton - 1634 Sq. Ft.
Cumberland - 1635 Sq. Ft.
Hatteras - 1982 Sq. Ft.
Rainier - 2106 Sq. Ft.
Holly - 1502 Sq. Ft.
Crane - 1553 Sq. Ft.
Egret - 1697 Sq. Ft.
Heron - 1829 Sq. Ft.
Ibis - 1830 Sq. Ft.
Pelican - 1835 Sq. Ft.
Sea Gull - 1947 Sq. Ft.
Teal - 1962 Sq. Ft.
Copper Ridge - 1590 - 2263 Sq. Ft.
Surrey Crest - 1705 - 2518 Sq. Ft.
Tifton Walk - 1856 - 2722 Sq. Ft.
Vernon Hill - 1889 - 2583 Sq. Ft.
Willow Bend - 1919 - 2637 Sq. Ft.
Abbeyville - 1656 Sq. Ft.
Castle Rock - 1756 Sq. Ft.
Kendall Park - 1868 Sq. Ft.
Martin Ray - 1961 Sq. Ft.
Dogwood - 2044 Sq. Ft.
Frederick Bay - 2155 Sq. Ft. Chestnut - 2274 Sq. Ft.
Lilac - 2282 Sq. Ft.
Wisteria - 2403 Sq. Ft.
Cumberland Hall - 2443 Sq. Ft.
Sycamore - 2597 Sq. Ft.
Bluffton Cottage - 2050 Sq. Ft. Chestnut Garden - 2246 Sq. Ft.
Morningside Lane - 2597 Sq. Ft.
Jackson - 2397 Sq. Ft.
Longleaf - 2397 Sq. Ft.
Yellowstone - 2423 Sq. Ft.
Rutledge - 2477 Sq. Ft.
Aspen - 2773 Sq. Ft.
Webster - 2856 Sq. Ft.
Rushmore - 2948 Sq. Ft.
Napa Valley - 2411 Sq. Ft.
Dunwoody Way - 2430 Sq. Ft.
Sonoma Cove - 2536 Sq. Ft.
Tangerly Oak - 2562 Sq. Ft.